We Guarantee To Beat Our Competitors Prices On Similar Wholesale Mixes! 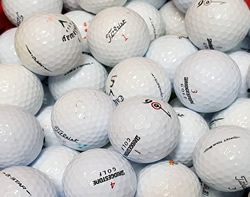 We have been selling wholesale used golf balls since 2001. This wholesale page is the most informative one you will see in the business. Many other companies want to haggle with you before you find out the true low price. We tell you the product and price up front as seen below. 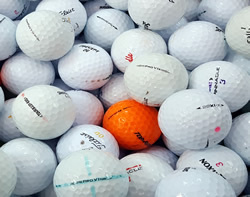 We offer several categories of golf balls at wholesale prices. Each of these categories has been created by our customers, and represent, the different selling strategies and options with certain models, brands, conditions, and qualities our customers have required from us. We will be happy to develop a mix that may best suit your companies needs, you need only ask. 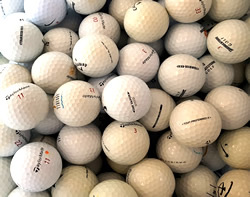 We sell millions of golf balls yearly, ship internationally and are currently supplying customers in over 30 countries with golf balls on a regular basis. With International shipping you want a company with extensive experience to ensure a smooth transaction. We would be happy to sell balls to you in your country. This is our top selling mix of golf balls. These are all grade 1,2 condition balls. This mix will contain 5% Pro V1 balls. This mix will contain 5% of the "Grade 1,2 Soft Cover Mix". It will also contain on average 25-35% of the balls found in our "Grade 1,2 Condition Premium Mix" as seen below. It will also contain on average 65-75% of our "Economy 1,2 Condition Mix" as seen below. These balls can be put through our optional three part chemical process for an additional cost. Minimum purchase is 5,000 balls. The "Pick Your Pony" option is available for this product. Economy Grade 1,2 Condition Mix 20 cents per ball USD This mix is perfect is you are looking for a low cost ball but still want high quality. These are all grade 1,2 condition balls. They are a random mix of balls with names like Wilson, Top-Flite, Maxfli, Pinnacle, Ultra, Strata etc. All the top brand balls have been removed. This is a great mix of balls if you don't need the Titleist Prov1 ball or just want a lower price, but still want to have top branded balls. These are all grade 1,2 condition balls. The only real difference between this mix and the "Grade 1,2 Condition Quick Sort Pond Run Balls Mix" is that the Titleist Prov1 balls have been removed and you will not receive any of the "Grade 1,2 Soft Cover Mix" balls. This mix will contain on average 20-30% of the balls found in our "Grade 1,2 Condition Premium Mix" as seen below. It will also contain on average 70-80% of lower branded balls like Top-Flight, Pinnacle and Wilson. These balls are very good for practice. These are grade 3 balls only. Some can be used for regular play. 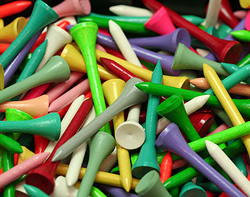 We put all types of balls in the mix, like Titleist, Nike, Callaway, Top-Flight, Pinnacle, etc. Minimum purchase is 10,000 balls. These are all the top brands. These are all grade 1,2 condition balls. They are a random mix of balls with all Titleist (except Prov's), Callaway, Srixon, Taylormade and Bridgestone models. Take out any one of the above brands for an additional $.04 increase per ball. These balls automatically go through our three part chemical process. These are all the top brands, but are all grade 1 or mint condition balls. 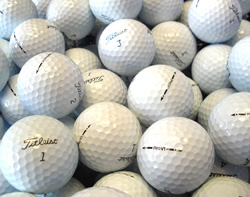 They are a random mix of balls with all Titleist (except Prov's), Callaway, Srixon, Taylormade and Bridgestone models. Take out any one of the above brands for an additional $.04 increase per ball. These are all premium brands and models. These are all grade 1,2 condition balls. They are a random mix of balls and this mix will contain at least 95% of the following. Nike - 2011, Nike One, Vapor, RZN. Bridgestone – B330, E-5. Taylormade – TP, Penta, Tour Preferred, Project, RBZ. Callaway – I, Z, iZ, I(x), I(s) HEX, Tour, Chrome, Black, SR. Srixon – Z-Star. No Titleist Prov 1 balls. The most dominant yet expensive brand and model on the market today. 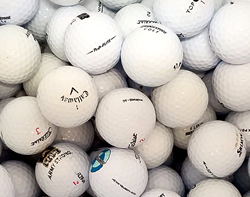 This mix contains 100% Titleist Pro V balls. These are all grade 1 and 2 condition balls. Sometimes also referred to as Pro V 1 392 and Pro V x 332. This is a random mix of all the different models of Pro V's since the ball was first produced. On average 1/3 will be Pro V x and 2/3 will be Pro V. This mix will not contain more than 3% sub-models of practice, x-out or remanufactured balls. Of course the highest percentage of the balls you will receive in this mix will be the latest models. Grade 1 Titleist Prov 1, Grade 1 Mix only 1.25 dollars per ball USD. The most dominant yet expensive brand and model on the market today. This mix contains 100% Titleist Pro V balls. These are all grade 1 or mint condition balls. Sometimes also referred to as Pro V 1 392 and Pro V x 332. This is a random mix of all the different models of Pro V's since the ball was first produced. On average 1/3 will be Pro V x and 2/3 will be Pro V. Of course the highest percentage of the balls you will receive in this mix will be the latest models. This mix will not contain any of the sub-models of practice, x-out or remanufactured balls. Sizes available are 2 1/8", 2 3/4", 3 1/4". Wood Only. Sold In bulk. Minimum purchase: 10,000 tees. Wide range of colors available based upon your choice of sizes above. This product can be added to your pallet of golf balls or sold separately. Please email for an updated list of prices and colors available. Optional Chemical Process - We offer an additional 3 part chemical process, which makes the balls at least a full shade whiter. While all the balls are clean, some of the iron content on the balls cannot be removed and this process reduces the intensity of the discoloration on the balls, and makes them whiter. The cost is 2 cents per ball for orders below 50,000 balls and 1 cent per ball above 50,000 balls. This process takes an additional 3 days. This is the best product if you are re-selling balls. Information - In all our mixes - logo, players marks and colored balls are not excluded. Colored balls like yellow, orange, pink, etc. are not included in our mixes except for the soft cover mix. Samples - We would be happy to put together a sample of balls for your review. We will however ask that you pay for the shipping or provide your UPS account number. Or you can simply come by and see the balls. Shipping - The prices above are for the product to be prepared. The balls are put in large tied plastic polypropylene woven bags of 600 balls each and put on a standard pallet then wrapped with cellophane. These woven bags should not be exposed to sunlight for long periods of time or the bags will break open. International Shipping – We have been shipping international to nearly every country for over 13 years. Therefore we have become quite knowledgeable about it. All foreign countries have import restrictions that don't allow a wooden pallet to be used or they require special certifications made, in this case we will use a plastic pallet, there is an additional $35 charge for each. We do NOT allow pickups. We have a negotiated rate with a local shipping/freight company. $95.00 for the first pallet and $85.00 per additional pallet, when shipped at the same time to any Florida location. If you are shipping anywhere else within the USA, please email us for a rate quote. These are not optional charges. If you arrange your own shipping with your own freight forwarder to ship the balls, let them know they will NOT be picking up the balls at our location, but that we will be shipping to them at their location. We do allow the drop-off of a container, however it must stay at our location for a period of up to three (3) hours. The biggest question our new international customers ask is. How much to ship to my country? While we would be happy to give you an exact rate quote, the cost to ship just 5,000 balls will range anywhere from about $300 to $600. Also the lowest shipping cost per ball is when you fill the pallet to its maximum size of 21,000 balls. This will increase the cost to $450 to $900 total. This is because the freight forwarder has initial charges and because of the added costs we charge to get the balls to the freight forwarders. You can choose to find and use your own freight forwarder or we can use one we use most often. We receive no incentive, but have found they are the quickest in giving out rates, shipping product and generally have the lowest and most competitive rates available in the Miami, FL Port area. Please be aware that a 20 foot shipping container will hold up to 350,000 golf balls when pallets are not used. Domestic Shipping - There is no charge for the wooden pallets we will use. We do NOT allow pickups. Where ever you are shipping within the USA, please email us for a very competitive rate quote. Payment - We require a minimum 50% non-refundable down payment to begin the processing of your order. When the processing time will be 2 weeks or less we will suggest immediate payment. All monies must be received before any product goes out. We accept checks, wire transfer and cash for domestic orders only. For international payments we accept wire transfer only. Your bank may charge you a wire transfer fee for this service, if so please add this additional amount to your payment when you send it. International payments must be in US funds. 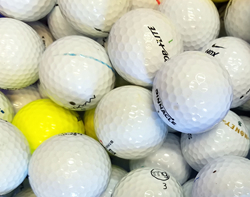 Preparation Time - We generally have up to 50,000 balls of our wholesale products in stock. Please email for preparation time above this amount. A maximum of 2 cents taken off for an order of over 100,000 balls. Discounts only apply to the Grade 1,2 Condition Quick Sort Pond Run Balls Mixes. 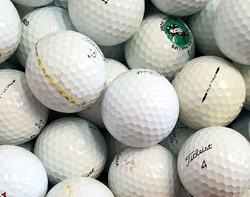 Understanding higher %'s in the pick your pony - Our frequent customers had been asking how they could get more Titleist Prov's and Premium balls, and still keep the price as low as possible. So we have designed "Pick your Pony". The higher you get with percentages of Prov's in the mixes, the higher the amount of Premium name brand, balls are in the mix. All of the mixes of these balls can be put through our optional three part chemical process for an additional cost. In the standard "Grade 1,2 Condition Quick Sort Pond Run Balls Mix" It will contain on average 65-75% of the balls found in our "Economy 1,2 Condition Mix". It will contain on average 25-35% of our "Grade 1,2 Condition Premium Mix". This mix will contain 5% of the "Grade 1,2 Soft Cover Mix". This mix will contain 5% of Titleist Prov balls. .28 cents per ball USD. In the 10% "Grade 1,2 Condition Quick Sort Pond Run Balls Mix" It will contain on average 35-45% of the balls found in our "Economy 1,2 Condition Mix". It will contain on average 55-65% of our "Grade 1,2 Condition Premium Mix". This mix will contain 10% of the "Grade 1,2 Soft Cover Mix". This mix will contain 10% of Titleist Prov balls. .37 cents per ball USD. In the 15% "Grade 1,2 Condition Quick Sort Pond Run Balls Mix" It will contain on average 15-25% of the balls found in our "Economy 1,2 Condition Mix". It will also contain on average 75-85% of our "Grade 1,2 Condition Premium Mix". This mix will contain 15% of the "Grade 1,2 Soft Cover Mix". This mix will contain 15% of Titleist Prov balls. .44 cents per ball USD. 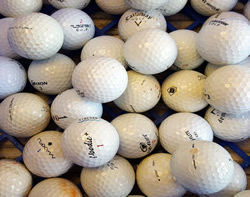 This is a type of plastic packing for golf balls to be sold in a retail market. This is a clear flat egg shell type of 12 pack container. Minimum order is 1 case of 280 for $130. Also 10 golf balls equates to about 1 pound, so 10,000 balls weigh 1,000 pounds. 1 of our pallets will hold up to 21,000 balls and measures 42'' X 50'' X 64".